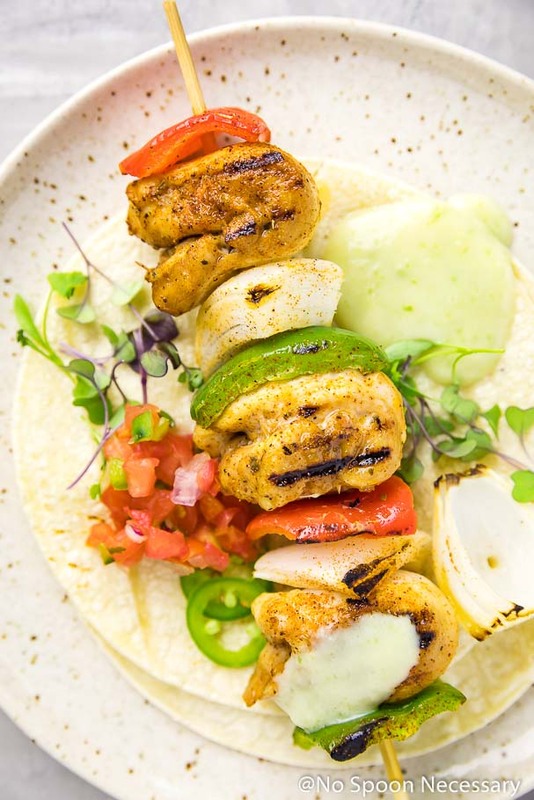 These Margarita Fajita Chicken Kebabs are a dynamic duo in ONE. 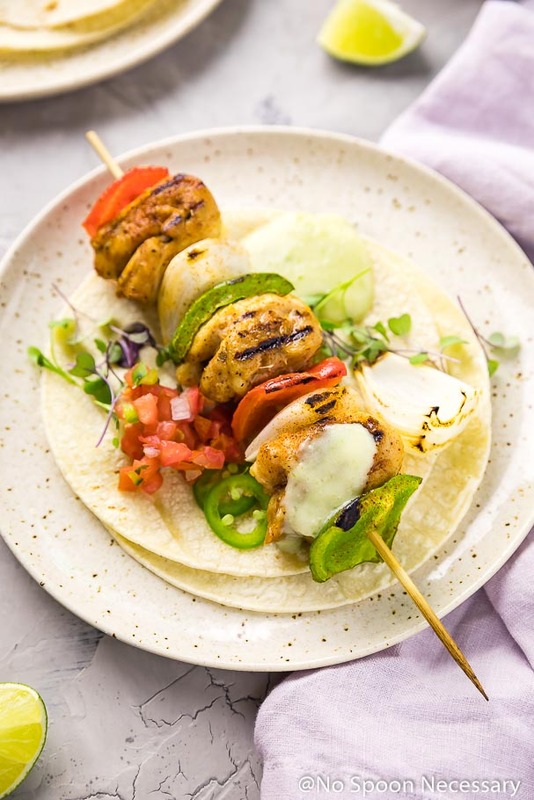 Packed with smoky fajita spice AND tangy margarita taste, theses skewers are perfect for backyard BBQ’s or entertaining! 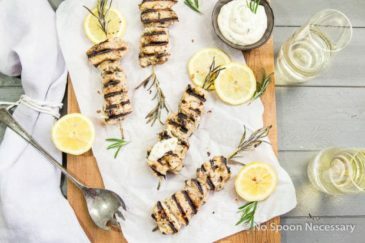 Served with a creamy tropical pineapple aioli perfect for dipping, these skewers are guaranteed to please! And just like that we have entered the last week of UNOFFICAL summer. I must stress the UNOFFICIAL part of that statement. Because, just to be clear, summer isn’t officially over September 22nd at 4:02 P.M EDT. And to be honest, at that exact moment in time you will be able to find me in the corner of my closet, donning all black and weeping tears of such sweet sorrow. As much as I do love the weather in fall, summer is definitely my spirit season, and I will be sad to see it go. However, there is always a bright side. And the silver lining here? We still have a little bit of time to bask in the glory of summer! So, we must sip all the fabulously fruity cocktails (<– I have one coming at ya on Thursday), eat tomatoes right off the vine, pluck strawberries straight from the fields (then possibly make some strawberry wine) and stuff our faces with ALL the magnificent meat on a stick! Aka Sensational Summer Spiked Skewers. Tender, tangy, smoky, slightly spicy, barely boozy, fajita spiced chicken skewered together with tender-crisp peppers and onions. Basically, it’s all the fabulous fajita flavors you love – herbaceous cilantro, earthy cumin, spicy cayenne – AND all the marvelous margarita vibes – tart lime, boozy tequila and orangey liqueur – IN ONE! 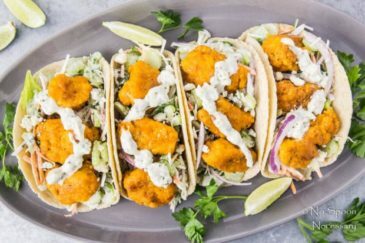 Served with a delectable creamy, sweet and spicy, tropical pineapple aioli that is just PERFECT for dipping (or straight up drinking with a straw, because no judgement here), this combination is nothing short of SPECTACULAR. Succulent, spiked skewers + silky sauce for dipping = EPIC summertime eats. Since it is STILL summer, and it’s ESSENTIAL we send the season out in style, this dynamic duo is a MUST for the upcoming Labor Day weekend! 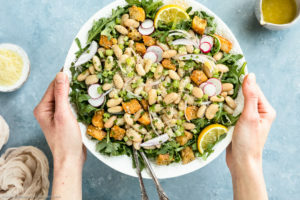 I used chicken thighs in the recipe below, however you can absolutely use chicken breast if you prefer, just make sure you cut the chicken breasts into roughly 1 – 1 ½’’ pieces. If using chicken thighs as instructed in the recipe, cut the thighs into strips roughly 1 – 1 ½’’ wide and then fold the strip over onto itself to create even sized, cube-like pieces. 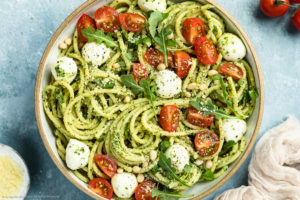 You can use any color bell pepper you would like for this recipe. You can use a combination of colors or one single color… whatever floats your boat. 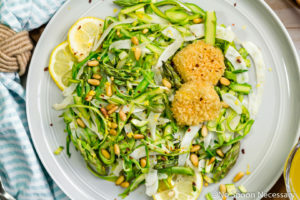 I used white onion in the recipe below, but if you prefer the bite of a red onion, you can use that instead! The longer you marinate your chicken, the more flavorful it will be. 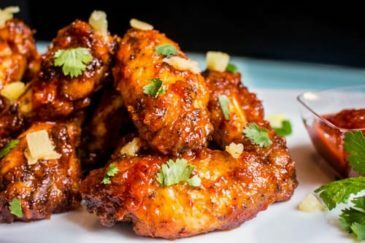 However, do not let your chicken marinate for longer than 5 hours or the lime juice in the marinade will start to “cook” the chicken and will cause the chicken to be mushy once grilled. If you are using wooden skewers for your kebabs, make sure you soak them in water for at least 30 minutes prior to using to prevent burning! I used mayonnaise in the aioli recipe below, however you can substitute sour cream or Greek yogurt if you prefer. The aioli can be made up to 3 days in advance and stored, covered, in the refrigerator. I actually think the aioli tastes better the next day since the flavors have had a chance to marry. The recipe below calls for Fajita Seasoning. You can either purchase your favorite fajita, or taco, seasoning from the store or make it yourself. I prefer to make a large batch myself and keep it on hand in the pantry. If you make it yourself you can control the amount of salt, the levels of spice, and customize it to your preference. I have included a recipe to make your own Fajita Seasoning in the notes section of the recipe below. Until Thursday, friends, cheers – to summer… and a smorgasbord of skewers. 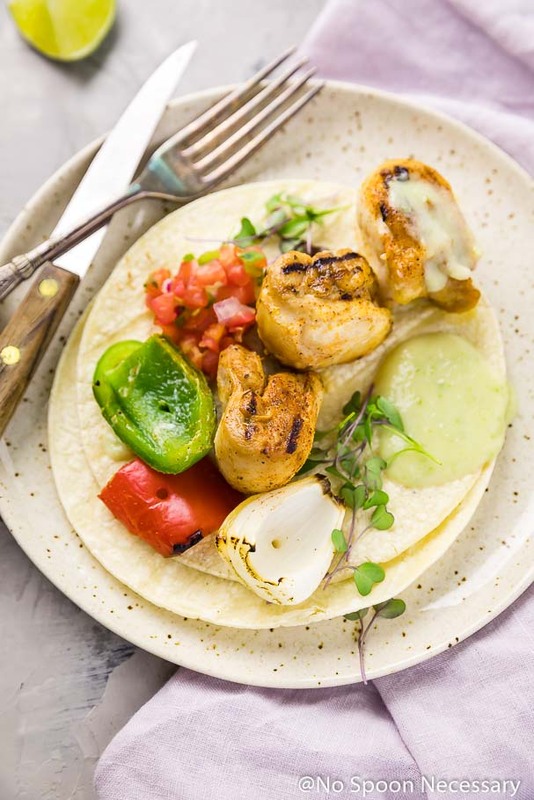 These Margarita Fajita Chicken Kebabs are a dynamic duo in ONE. 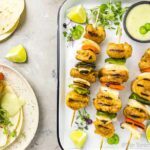 Packed with smoky fajita spice AND tangy margarita taste, theses skewers are perfect for backyard BBQ's or entertaining! 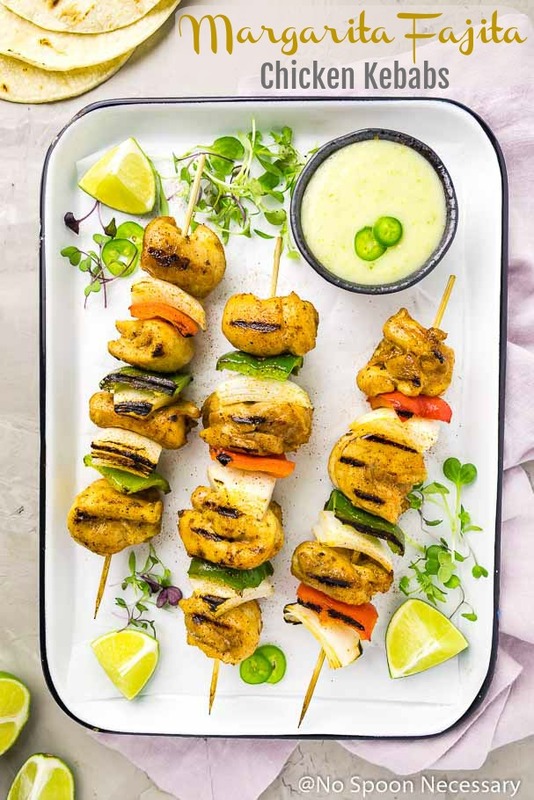 Served with a creamy tropical pineapple aioli perfect for dipping, these skewers are guaranteed to please! Marinate the chicken: In a small bowl, combine the ingredients for the marinade with 2 teaspoons of Fajita Seasoning. Whisk to combine. Place the chicken in a large zip-closure bag and add the marinade. Seal the bag, removing as much air as possible. Transfer the chicken to the refrigerator and allow to marinate for at least 1, and up to 5, hours. 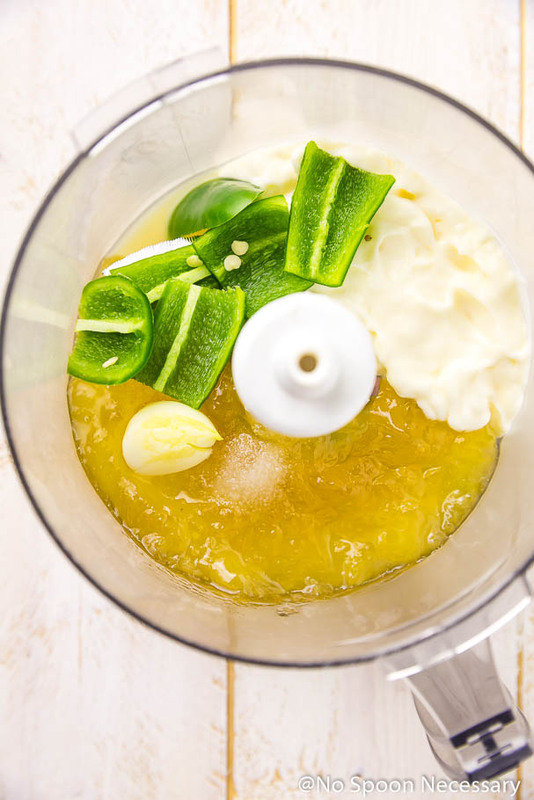 Meanwhile, make the aioli: In the bowl of a food processor, add all the ingredients for the aioli and puree. Taste and adjust for seasoning and flavors. Transfer to the refrigerator and allow the flavors to marry for at least 30 minutes before using. Remove the chicken from the marinade, pat dry (discard the marinade), and transfer chicken to a large bowl. 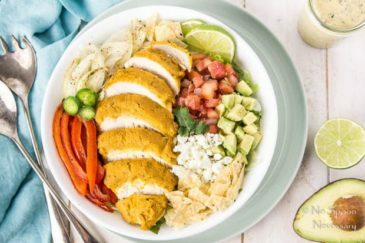 Sprinkle with the remaining 1 ½ teaspoons fajita seasoning and use your hands to rub/thoroughly coat the cubes of chicken with the seasoning. 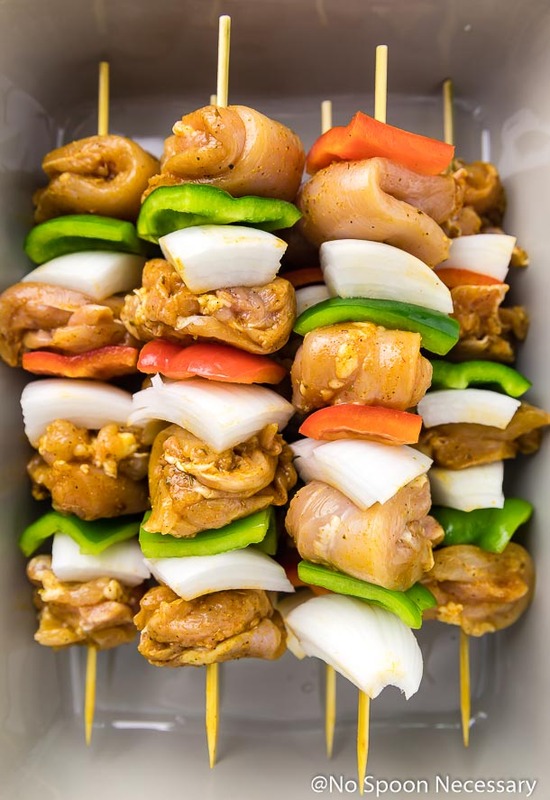 Prepare the kebabs: Thread the chicken onto skewers*, alternating with peppers and onions. Grill: Preheat grill to medium-high heat and lightly oil the grill grates. 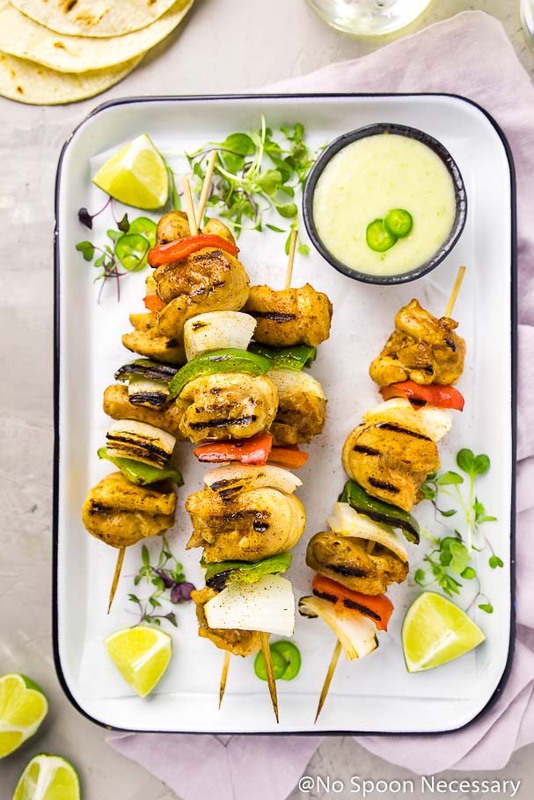 Place the kebabs on the grill, cover, and cook until the chicken is well browned on all sides and registers between 160-165F on an instant read thermometer, about 8-10 minutes, turning once or twice during cooking. Serve: Transfer the skewers to a platter. 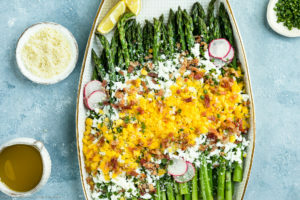 Serve with aioli and optional accompaniments on the side. Enjoy! 1. I used chicken thighs in the recipe, however you can absolutely use chicken breast if you prefer, just make sure you cut the chicken breasts into roughly 1 – 1 ½’’ pieces. 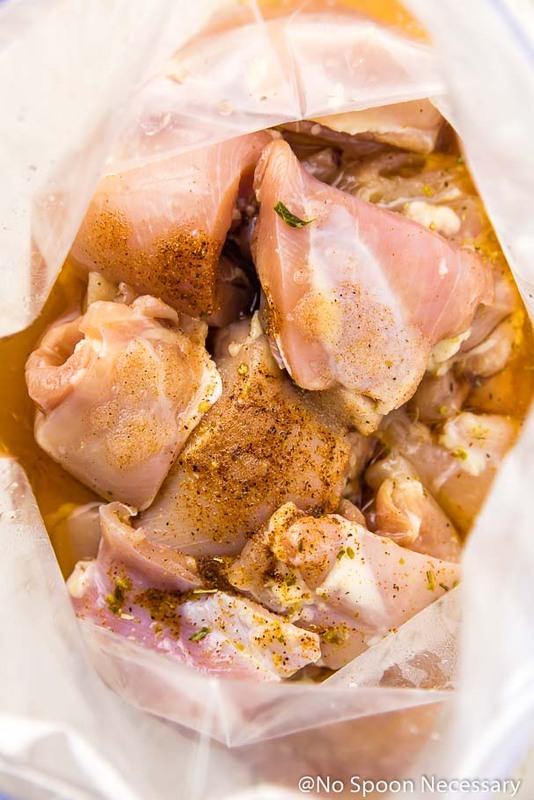 If using chicken thighs as instructed, cut the thighs into strips roughly 1 – 1 ½’’ wide and then fold the strip over onto itself to create even sized, cube-like pieces. 2. You can use any color bell pepper you would like for this recipe. You can use a combination of colors or one single color… whatever floats your boat. 3. 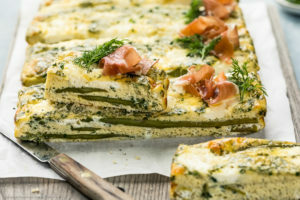 I used white onion, but if you prefer the bite of a red onion, you can use that instead! 4. The longer you marinate your chicken, the more flavorful it will be. 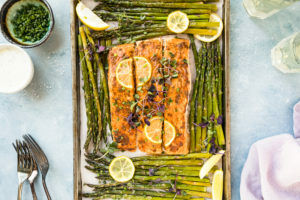 However, do not let your chicken marinate for longer than 5 hours or the lime juice in the marinade will start to “cook” the chicken and will cause the chicken to be mushy once grilled. 5. If you are using wooden skewers for your kebabs, make sure you soak them in water for at least 30 minutes prior to using to prevent burning! 6. I used mayonnaise in the aioli recipe, however you can substitute sour cream or Greek yogurt if you prefer. The aioli can be made up to 3 days in advance and stored, covered, in the refrigerator. I actually think the aioli tastes better the next day since the flavors have had a chance to marry. 7. The recipe below calls for Fajita Seasoning. You can either purchase your favorite fajita, or taco, seasoning from the store or make it yourself. I prefer to make a large batch myself and keep it on hand in the pantry. If you make it yourself you can control the amount of salt, the levels of spice, and customize it to your preference. *Nutritional information includes both the skewers and the aioli! Fatija Chicken Kabab looks so delicious and yummy.I loved your way of cooking and dishes. My sister prepared for me. I like it you really deserve this review. Last night I made Punjabi Yakhni Pulao Recipe, Its taste also awesome.Sharing a link with you: ( http://sooperchef.blogspot.com/2017/08/punjabi-yakhni-pulao-recipe-sooperchef.html ). Admitting that I’ve also had to look-up “last day of Summer” on Google…hard to tell when you’re living out here in Los Angeles! This looks blissful. Refreshing and perfect for the rough heat we’re having. Love, love the marinade on this one! I am with you – summer is not ending anytime soon and I will continue to celebrate it everyday! What a great flavor combination! These look crazy good! And perfect for summer! I am giving summer one last hurrah this weekend! I’ll be barbecuing all weekend long and these kebabs are on the menu! Love the jalapenos in the marinade. Great marinade and kebabs. I love a good fajita!! Summer is my fave to but I am starting to day dream of Fall eats but not quite there yet 😉 Take care.